“Phenomenal experience in the here and now” and “perception of ourselves to be in a particular situation” are two facets of the active self that is ultimately part of consciousness, of the “feeling of what happens”. A prerequisite to consciousness is intentionality, the capacity of humans and other animals to have mental states that are “about” things in the world. 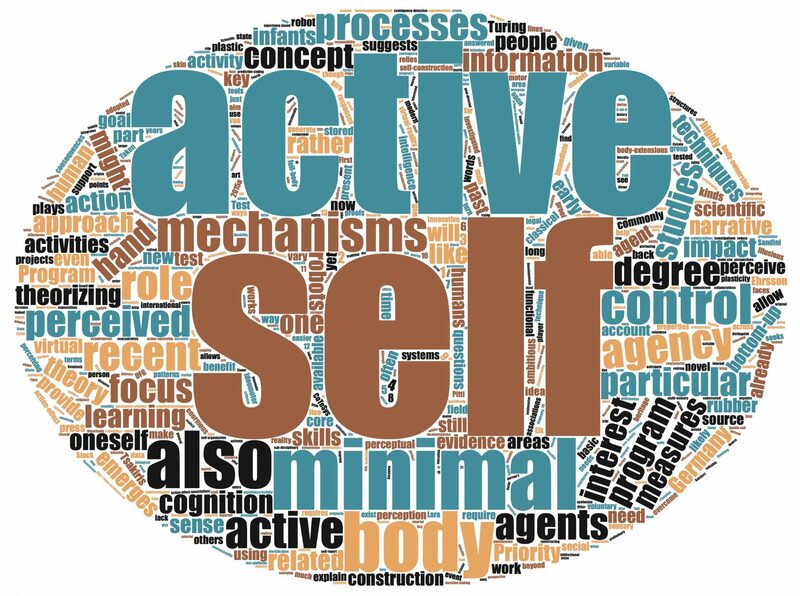 The active self, we argue, requires intentionality of two directions of fit and six psychological modes. World-to-mind, the direction of fit of the motoric flavor of intentionality, includes intention-in-action (ongoing movement behavior), prior intention (planned actions that are not yet initiated), and desires (orientation to outcomes that motivate action). Mind-to-world, the direction of fit of the perceptual flavor of intentionality, includes perception (immediately available), memory (available through retrieval), and beliefs (linking percepts, actions, and outcomes). Body ownership, a core signature of the self, entails perception of body parts, and memory to enable their recognition. Agency, a second core signature of the self, entails intention-in-action to generate movement, but also prior intention to generate sequences of actions toward a goal. Agency thus also entails desires of particular outcomes. Contingency learning may be construed as the establishment of beliefs that link percepts and actions to outcomes. Our goal is to provide a process account for how the sensory-motor grounding of intentionality can give rise to an active self. Within the theoretical framework of Dynamic Field Theory, intentional states are modeled as self-stabilized patterns of activation linked to the sensory and motor surfaces in embodied dynamic architectures. In a developmental perspective we will study visual exploration, exploration of actions and contingencies, and imitation. To account for patterns of looking that embody curiosity, visual recognition, and recognition of infants’ own body, we will model looking behavior based on the psychological models of intention-in-action, perception, and memory. Prior intention, desire, and belief will be implemented in a process model of contingency learning. Second-level intentionality in which intentional states are formed about the systems own internal representations will be used to account for imitation. On the hypothesis that only actions within an infants’ behavioral repertoire are imitated, mental simulation will be shown to be critical to deferred imitation and self-agency, the intentional state of experiencing the self as the cause of one’s actions. Mental imagery will be shown to provide the substrate for self-perception. We will examine and illustrate the process models through simulation. As a heuristic device, we will implement models on a vision-based robot to examine the extent to which they capture all necessary processes. Comparison to developmental experiments will subject the theoretical accounts to empirical test.